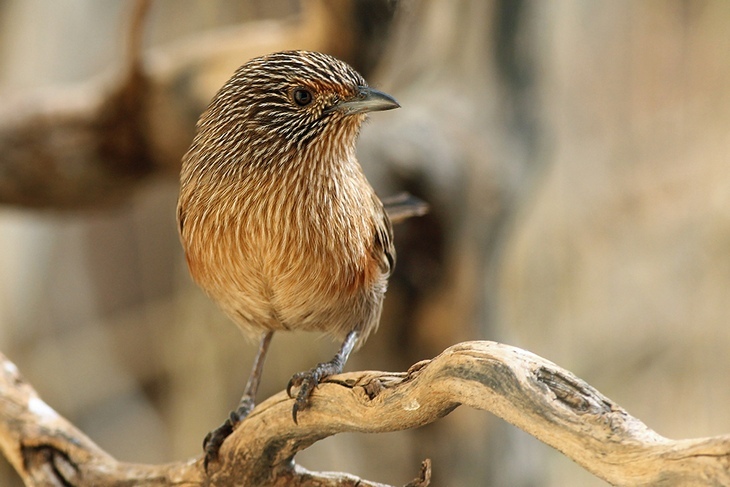 This is one of Australia’s epic birding adventures, where we search for nine of Australia’s 13 Grasswren species: Striated, Short-tailed, Western, Thick-billed, Eyrean, Grey, Kalkadoon, Carpentarian and Rusty Grasswren. From the vast expanses of ‘mallee’ scrub in the Vic-SA border region to the Flinders Ranges, we travel up the Birdsville track through the outback, visit the stark country around Boulia-Winton and finish in the ranges around Mt Isa. This trip is a real adventure (yet fully accommodated), taking us through the heart of the outback during the late Australian winter season, generally a great time to go birding. During these 12 days we expect to see over 200 species, and besides the Grasswrens we have a good chance of sought-after birds as Red-lored Whistler, Banded Whiteface, Chestnut, Cinnamon & Chestnut-breasted Quail-thrush, Gibberbird, Yellow Chat, Inland Dotterel, Flock Bronzewing, Spinifex Pigeon, Painted Finch and even the enigmatic Grey Falcon. We’ll drive around 4000 km and there will also be lots of walking, with early departures and late finishes each day. While we may encounter frosty mornings, during this time of year the weather is generally quite pleasant. Some of the accommodation is in basic rooms without private facilities.